Remedy 4-in-1 Body Cleanser cleanses, moisturizes, provides mild protection against transepidermal water loss (TEWL) and nourishes skin in one step. Helps reduce odor. Optimizes shelf space and nursing time. Ready-to-use, no-rinse foam stays in place to prevent product spills, waste and patient discomfort. One bottle contains over 340 pumps of foam. Harsh soaps and surfactants strip skin of moisture and contribute to TEWL. Remedy 4-in-1 Cleansers have a phospholipid base that binds both water and nutrients to gently clean and condition the skin. 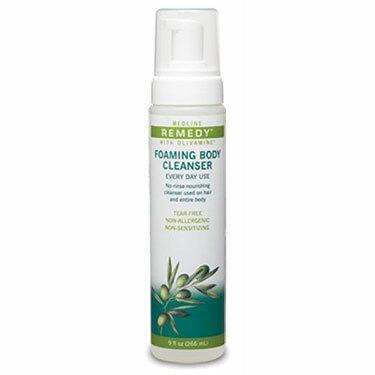 Remedy cleansers contain ingredients derived from natural and organic oils that mimic the body\'s natural lipids. Remedy cleansers can also be used during showers in place of soaps. The phospholipids will gently cleanse the skin without stripping it from its natural oils. Olivamine is a blend of antioxidants, amino acids, vitamins and methylsulfonylmethane (MSM). These ingredients are all known to play a vital role in basic cellular construction and protection. Olivamine contains antioxidants like hydroxytyrosol, the most potent antioxidant known today (derived from olives). It also contains amino acids like L-proline, L-cysteine and glycine - three of the main building blocks of collagen. These components are also treated with photoacoustic resonance to help minimize the tendency for inflammation, and to ensure they can be rapidly accepted by the skin. Available in individual 9oz. bottle or a case of 12, 9oz. bottles as well as 5 oz foam pump bottles individually or in cases of 12. Parentgiving is a good company to deal with. This product is very good & I receive it on time every time. Pros:Easy to use in between shower because no rinsing is required. This is a very good product. It cleans really well and leaves the skin soft. Nice fragrance also, not perfumy or overwhelming.